I’ve been busy on G4 lately. I took some people to school in University Week last week. Two of the articles concerned academic programs that teach game design, an article about Southern Methodist University’s Guildhall program, and another one about the GAMBIT Lab at the Massachusetts Institute of Technology. But the third article is what generated the most discussion, about how to become a video game journalist. Writing that third piece was surreal. Just a year ago I sold my first professional piece to The Escapist. Now here I was, telling other people how to become a video game journalist? I think the fact that the position is so ill-defined prevented me from feeling like that article wasn’t just a colossal act of hubris. Other people call me a video game journalist, and I wear the name because it obviously serves me to do so, but I tend to think of the full-timers and staff-writers, or at least people who are freelancing full-time for a gaggle of sick outlets like my friend Gus Mustrapa, as “video game journalists,” versus myself, who is still very much on the outside. Getting the chance to interview someone like Karen helps alleviate that feeling a little. Really, what I said in the advice column is true. If you can pitch, you can freelance. 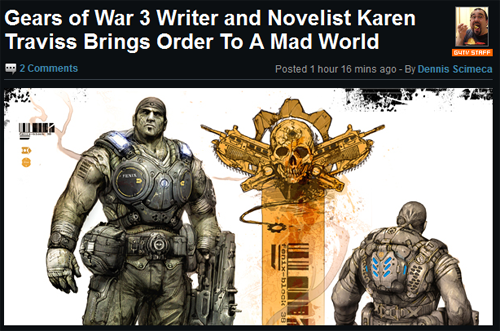 Lots of people interviewed Karen before Gears 3 came out, but I hadn’t seen the angle establishing her work as primary creation, which is what I found most interesting. Sometimes that’s all it comes down to, figuring out what you find interesting and then hoping that someone else agrees. I think that’s why having pitches rejected is difficult to not take personally at first. It can feel like someone is telling you that what you’re interested in is stupid! But then you learn that a pitch rejection might just mean that your article isn’t right for that outlet, at that time, and you try another outlet. I enjoyed the opportunity to pimp Bitmob again, and I’ll sing their praises as giving me the confidence to start pitching regularly until the day I die. And seeing Dan “Shoe” Hsu mention me as a mark of Bitmob’s success in this article on Realm of Gaming was a thrill. I really want he and Demion Lynn to be successful with their site, as I think they’re doing something necessary and beneficial to everyone who reads and writes about video games: opening the door to new voices. – Nick Chester is giving up his Editor-in-Chief position at Destructoid, one of the most popular video game outlets in the world, to take a publicist job at Harmonix here in Boston. While I’m glad he’ll be in Beantown such that we can hang out, as he seems like an awesome guy, seeing someone walk away from a position like that makes me think about how viable doing this job full-time is. We see video game journalists switching over to PR on a regular basis, probably because it’s stable and pays a hell of a lot more. My new acquaintance Chris Remo over at Irrational Games used to be the Editor-in-Chief of Shacknews and an Editor-at-Large at Gamasutra. Meagan Marie from GameInformer left to become the Community Manager at Crystal Dynamics. Troy Goodfellow, a renowned strategy game writer and podcaster, also made the jump. It’s disheartening, even if I think I understand why they did it. I saw that news spread through my game journo network on Twitter like wildfire. It has not been an encouraging week for future prospects, but at least I’m going into all of this eyes WIDE open. In other news of my goings-on, my First Person column over on Joystick Division gets stuck in a meta cycle often. Someone recently labeled me as “someone who writes about writing about video games,” and that stuck in my craw because clearly I’m doing a lot more than that. But I can’t help but find some of these larger issues fascinating, like the required distance between the gamer and critic, the ethical ramifications of sitting on information you think the consumer deserves to have on account of signing on to review embargoes, and how the shallow nature of judging games by whether they are “fun” or not is largely responsible for how fucked-up our review system is. To a point, I’m working these issues out for myself in front of an audience, but I also don’t see many people asking these questions, least of all professional video game journalists, where anyone can join in. Kill Screen ran some stuff about a game journo intern recently, but other than that, I don’t see much of this sort of meta-thing. Perhaps the audience isn’t interested, but I think they’re important questions to ask, even without definitive answers. Dennis, September 22, 2011. No Comments on An interview with Karen Traviss. Category: Posts.